Just informing you all that all the theories have been re-archived for the third time on the Wayback Machine, in case there was any worry about them getting lost. For reference by Montinevra: This is my confirmation that the account "User:Apocrypha32" is in fact mine and I've moved out of my old account. 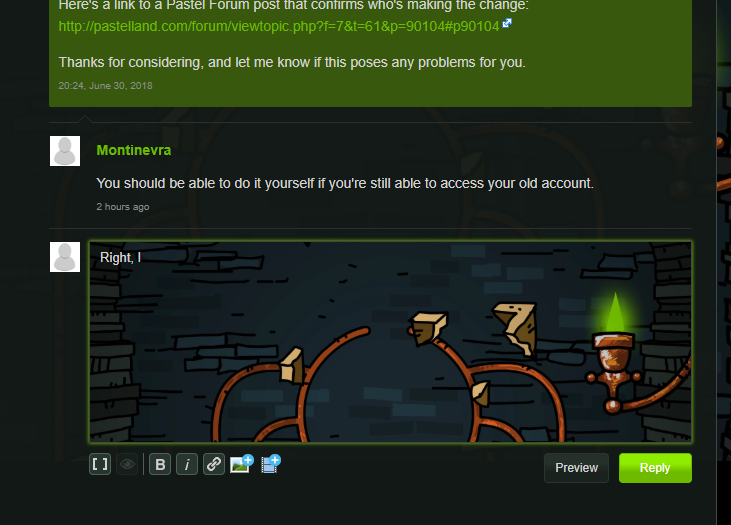 It's been a while since anyone has reported seeing an actual glitch on the Wiki, so I thought I'd share it with you all. That's a thing of beauty, that's what that is. I am not even kidding, that looks kind of nice. Fandom. Let's just, let's...let's cozy on down and have a chat. You see, I have diligently tried to keep the color schemes on the Wiki consistent for several years. I've slaved over finding the perfect hex codes and backgrounds to match for a few different theme rotations and campaigned hard to have the favorite themes democratically elected by members of the Submachine Wiki. It has taken time and cost blood, sweat, and tears. And in one fell swoop you have the audacity to plaster a cyan self-righteous banner across the top, cutting into my precision-cut color themes. On what authority do you have the audacity to do such a thing! Such travesties do not simply go unnoticed.